These project photos of the Upper Swift Creek project provide an excellent tour of an abandoned hydro system restored with state of the art components. 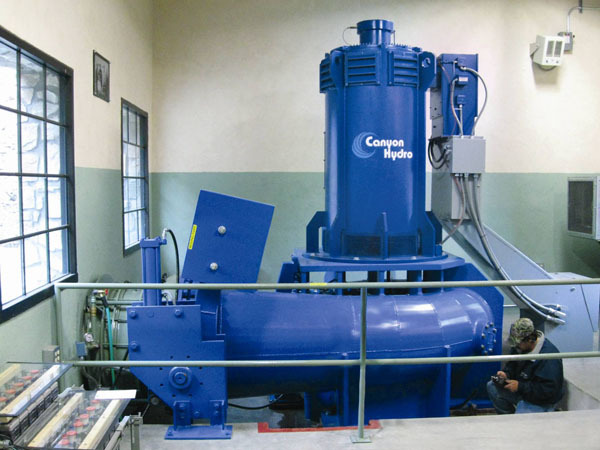 The completed installation of the Canyon Hydro 910kW Francis turbine. The abaondoned powerhouse before work began. The first step involved cutting a hole in the top of the concrete roof to allow crane access to the inside. View into the powerhouse from the new hole in the roof. An interior view of the powerhouse before restoration. Demolition of the old tailrace. Construction of the new tailrace. The original penstock, showing evidence of years of inoperation. Preparation for new penstock entry into powerhouse. New adapter to connect the penstock to the turbine. Removal of old Draft Tube in preparation for replacement. Arrival of the replacement Draft Tube. Setting the new Draft Tube into place. Steel lattice to reinforce the concrete base for the Draft Tube. Pouring the concrete to anchor the Draft Tube. Setting the sole plate for the turbine. The Francis tubine spiral case, ready to set in place. Closeup of the Francis turbine runner before installation. Turbine sprial case positioned in place. Pouring the concrete to anchor the turbine system. Peparation for concrete floor over electrical conduit. View of the turbine from outside the powerhouse, ready for penstock connection. Positioning the penstock adapter for connection to the turbine. Ready for Turbine Inlet Valve (TIV) and couplings. Turbine Inlet Valve (TIV) and components of the counterweight close actuator. Completed TIV and coupling, ready for water test. A good example of why there is a hole in the roof. Setting the generator in place. Canyon Hydro Vice President Richard New, right. Testing electronic controls and switchgear. The completed powerhouse and tailrace in operation.